(NaturalNews) Between eating unhealthy foods, exposure to harmful environmental factors, and a host of lifestyle situations that vary from person to person, it's not a surprise that dangerous heavy metals are lurking in our bodies. There are tons of reasons for this build-up of toxins in our system: continual indulgences in junk food diets, living in an area with poor air or water quality, engaging in habits like smoking, and of course, the fact that the likes of cancer-causing herbicides like Roundup are being used on area playgrounds and public spaces, are just a few of the contributing factors. Health Ranger Mike Adams, who runs a heavy metals analysis science lab, is an expert on the topic of heavy metals. He notes that the "... rise in the concentration of toxic substances in our environment and foods" contributes to clinical mental insanity. He feels that factory farming, where animals are fed poisonous chemicals and then their feces is recycled in the soil that grows food that humans eat, is also a main driver behind all of this toxicity. He writes, "To my horror, I've come to the conclusion ... that humanity is driving itself insane with relentless chemical contamination and heavy metals pollution that's driving human minds to clinical madness." Our bodies are therefore filled with toxins. Emotional problems, mental deterioration, brittle bones, heart disease and cancer are a few of the problems associated with such toxicity. How then, can we detox from heavy metals? It's essential that we detox, but not everyone is aware of just how easy it is to break free of unhealthy habits (or at least be aware of methods to improve it, such as smoking cessation). But rest assured, there are ways to help get health-harming heavy metals out of your body so you can enjoy ongoing health maintenance, physically and mentally. Of course, it's common sense to refrain from eating foods known to come from factory farm settings. Choose healthier options by eating wild as opposed to farm-raised foods. Also, opt for fresh, organic foods – fruits, vegetables, nuts and seeds especially. Don't take up smoking, or try to quit if you're already a smoker. And certainly, don't even think of spritzing Monsanto's Roundup on your lawn. In addition to partaking in these healthy habits, you'd be missing out on improving your health if you didn't turn to cilantro. Ingesting the herb is a great way to detox naturally and affordably; after all, it's loaded with vitamins K and A, as well as a variety of essential minerals that can give your body the cleansing boost it needs. In particular, it's known to help remove mercury from your system, and to have powerful (and proven) anti-inflammatory, anti-fungal and antiseptic qualities. Plus, it won't break the bank; it's an investment in your health that won't set you back financially. What's not to love about cilantro? 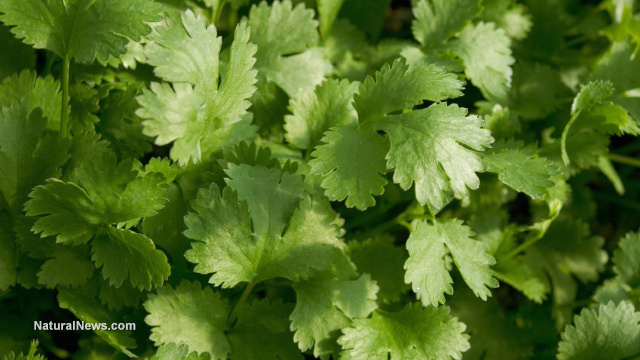 All you have to do is head to the store and pick up some raw, organic cilantro. Then, return to the comfort of your home and add it to your favorite smoothie by mixing it with other healthy foods in your blender. Drink your way to reduced inflammation thanks to cilantro's ability to tackle heavy metals! Or, you can chop some up and add it to other non-blended meals you may prepare. Consider adding it to salads, sandwiches or a topping to other healthy dishes you make. Feel free to experiment with tastes and textures, but know that the more healthy ingredients you add, the better. When it comes to cilantro, you really can't go wrong. Add it to a range of foods to keep your health in the best shape possible.